It is clear that US companies with more than 50% of their revenue outside the US, are generating just half the earnings growth rate of US companies with more than 50% of their from inside the US. 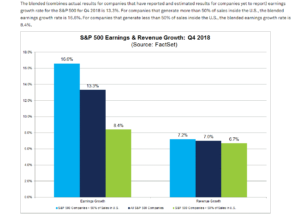 Roughly 35% – 40% of total SP 500 revenue is non-US so there is no question the stronger US dollar is having an impact on SP 500 earnings, that has been clear. The Factset graph actually helps quantify the percentage impact. Here was our last comment on the US dollar in January, 2018 and the blog post notes how puzzling it was for the dollar to be weak, when tax cuts were already in hand, and interest rates were rising (all these things would be expected to attract capital to the US, strengthening the dollar) and in fact the dollar did strengthen for the rest of 2018. The UUP would be one way to play a “dollar-bull” scenario, although owning the position generates a K-1 for clients and after having a few conversations with clients that needed to amend their returns because of the UUP, I stopped owning for clients. The dollar was one of the few assets generating a positive return in 2018, up 7% – 8% on the year per one source. If Brexit would get resolved and a China trade agreement would get inked, I could see some relative strength evolving for non-US currencies. Also with the Fed done for a while, thus alleviating the “real rate of interest” differential with foreign countries, that could be another reason for the dollar to weaken. In late 2014 through March, 2015 the US dollar had one if its strongest 6-month periods in recent memory, and the strength impacted earnings for most of 2015. Keep your eye on the dollar for the next few weeks; I wouldn’t be surprised to see it change direction and start to weaken a little bit.